The rear of the ES is clean and sharply chiseled, with LED taillamps that wrap around the quarter panels to provide a continuous styling line from any angle. Finishing off the rear end is a lower valence that further emphasizes the wide stance through the use of chrome exhaust finishers at each corner. On the F SPORT model, a trunk lid spoiler adds a tasteful hint of performance while dark accents along the taillights and lower valance are more subtle indications of its sporting nature. That foundation is the newly developed GA-K chassis. It’s an exceptionally rigid front-wheel drive chassis made from several grades of high strength steel. The GA-K chassis also incorporates far more structural adhesives than the previous ES chassis as well as the addition of laser screw welds. A total of 20 metre of adhesive is used throughout the structure, more than twice the amount (8.2 metre) used previously. Laser screw welding, a construction method shared with the LS sedan, is used in 120 locations throughout the GA-K chassis to further solidify the already robust structure. Additional measures are used to improve front end stiffness including a strut tower brace, multiple reinforcement panels for the strut towers themselves and new radiator support braces. Building an all-new structure also gave Sakikabara and his team the opportunity to address noise and vibrations at their source. Sound deadening insulation now covers 93% of the floor pan (up from 68%) while underbody covers and front fender liners further reduce road noise. The installation of performance dampeners is used to reduce vibrations on the Ultra Luxury and F SPORT models. Although the design of the front suspension is similar to the previous ES, several changes have been made to improve overall responsiveness. The angle of the strut itself has been revised to better align it with the load path from the lower control arm for improved ride quality while an increase in caster angle (+2 degrees) and caster trail (+8 mm) help to improve straight line stability. Newly developed Dynamic Control Shocks are capable of responding to even the smallest movements thanks to a non-overlapping auxiliary valve that allows damper oil to flow in either direction before entering the main valve. A new rack-assist type Electric Power Steering (EPS) system is used to deliver a more precise steering feel. Unlike the previous ES which used a steering-column-mounted assist motor, the new EPS setup mounts the assist motor directly on the steering rack which returns more precise feedback to the steering wheel. The new layout also allows for additional steering wheel adjustability with 30 mm of additional tilt and 140 mm of additional telescoping range. On the F Sport model, an Adaptive Variable Suspension (AVS) is offered that replaces the Dynamic Control Shocks with adjustable dampers. Similar to the systems offered on the LC coupe and LS sedan, the AVS system on the ES is capable of 650 levels of adjustment to deliver optimal ride quality and precise control. All ES 350s are powered by a 3.5-litre V6 (2GR-FKS) that is designed to deliver effortless acceleration along with impressive efficiency. The latest V6 now features the D-4S fuel injection system which uses high pressure injectors to deliver fuel directly into the combustion chamber along with a low-pressure system that delivers fuel to the intake ports. Together with the addition of Variable Valve Timing-intelligence Wide (VVTi-W) for the intake valves, the engine is capable of operating on either the traditional Otto cycle or more efficient Atkinson cycle depending on the situation. Multiple upgrades to reciprocating parts along with a redline increase from 6,200 rpm to 6,600 rpm results in a total of 302 horsepower at 6,600 rpm and 267 lb-ft of torque at 4,700 rpm. Both numbers are up significantly (+34hp, +19 lb-ft) compared to the previous V6. To complement the power of the updated V6, an all-new 8-speed Direct Shift automatic transmission is used on all ES 350s. The newly developed transmission uses an ultra-thin torque converter and a multi-plate lock up clutch to maintain a direct connection in almost all driving situations. The result is an automatic transmission that has the direct feel of a dual clutch design along with the off-the-line smoothness of a traditional torque converter automatic. Compared to the previous 6-speed automatic, the 8-speed Direct Shift transmission has a wider range of ratios designed to return improved fuel efficiency and more responsive performance. For instance, the first gear ratio in the previous 6-speed was 3.30:1 while the new 8-speed offers a 5.51 first gear. On the high-end, the new 8-speed allows the engine to run between 250-300 rpm lower at 100 km/h compared to the 6-speed thanks to a taller final drive ratio (2.56) made possible by the more flexible transmission ratios. An all-new 2.5-liter, four-cylinder gas engine (A25A-FXS) running on the Atkinson cycle is coupled with a smaller, more power dense electric motor and an all-new hybrid transaxle. The preliminary internal results are a combined 215 total system horsepower and a manufacturer estimated 5.3 L/100 km city/highway combined. The nickel metal hydride battery that powers the electric motor has been relocated from the trunk to underneath the back seat. This was made possible by a 120 mm reduction in the height of the battery and the adoption of a more compact cooling system. Moving the battery under the seat not only frees up trunk space, it also improves the front to rear weight distribution of the ES for better handling. All Lexus interiors are designed to blend a driver-centric cockpit with spacious and comfortable areas for the passengers. This concept was introduced in the LC coupe, refined in the LS sedan and now expanded to the ES. In the ES, the idea is taken a step further by placing all the main information displays within the driver’s line of sight. This includes the ultra-sharp LCD instrument panel that features a large analog tachometer, digital speedometer and easy-to-read multi-information display. Standard models use a 7-inch screen while the F-SPORT display measures 8-inches and features a movable center ring similar to the one used in the LC. By hitting a button on the steering wheel, the ring slides to the right to open up more space for the multi-information display on the left side of the screen. Another means to reduce driver distraction is the optional 10.2-inch head-up display that projects relevant vehicle information onto the windshield. Fully adjustable to suit the driver’s preferred parameters, the colour display offers the largest display area in the luxury class. If additional information is needed, the Lexus Multimedia System sits high on the dashboard in a position that minimizes distraction. Measuring eight inches wide on standard models and 12.3-inches wide on the higher grades, the Electro Multi Vision (EMV) display features crisp, easy-to-read graphics and a revised menu system that includes an optional hybrid navigation system that blends on-board information with cloud-based data for the most accurate directions possible. The updated Remote Touch Interface (RTI) pad now has more usable surface area and vibration feedback to make it easier to use. What the driver sees is also enhanced by what he or she feels, as the driving position in the ES has been refined with a more natural steering wheel angle, revised pedal positions and optional 10-way adjustable front seats. The steering wheel itself is borrowed directly from the LS and features an ergonomically shaped rim and optional wood trim and heating elements. Due to the reconfigured rear suspension, cargo room has been increased over the previous model. The ES now boasts 16.7 cubic feet of trunk space along with additional underfloor side pockets for smaller items. The hybrid model also offers the same cargo dimensions since the battery pack is located underneath the rear seat. An optional hands-free trunk opener has also been added to make loading cargo easier than before. Staying connected has never been so important to ES owners, so there are now multiple ways to engage with technology in a safe and convenient manner. 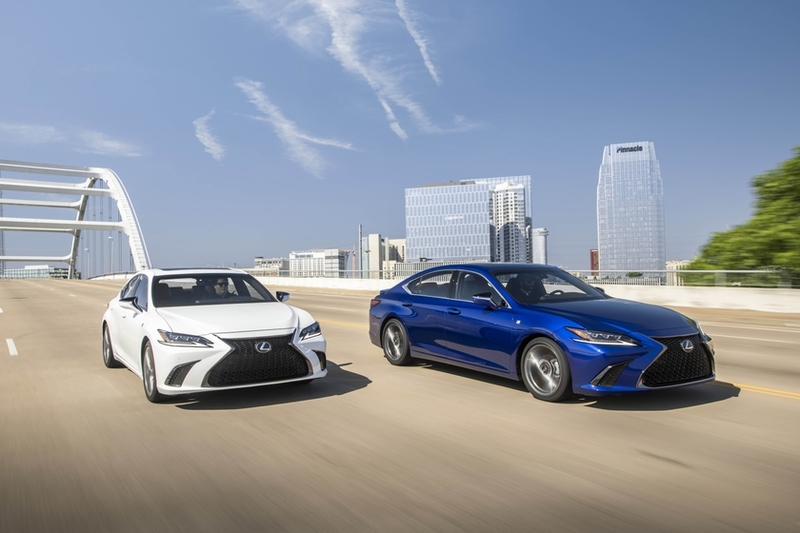 The new ES is the first Lexus product to offer Apple CarPlay™ phone functionality, enabling drivers to control their iPhones® through the dashboard display screen or with Siri Eyes Free® voice control. One element of the ES that hasn’t been radically transformed is its dedication to safety. All versions of the seventh-generation ES feature Lexus Safety System+ 2.0 as standard equipment. Already one of the most sophisticated systems of its kind, LSS+ 2.0 adds new capabilities that further expand the scenarios in which it is designed to provide additional safety to the driver and passengers. One such feature is daytime bicyclist detection which is part of an enhanced Pre-Collision System (PCS) that employs both a millimeter wave radar and a monocular camera sensor. Already designed to detect an oncoming vehicle or pedestrian, the Pre-Collision System’s ability to potentially detect bicyclists has been enhanced by widening the detection area of the radar. PCS has also been enhanced to help better detect pedestrians in low light situations by increasing the camera’s sensor sensitivity and dynamic range. An enhanced version of the previous Dynamic Radar Cruise Control System is also part of LSS+ 2.0. It uses more advanced sensors that are designed to provide smoother acceleration and braking in heavy traffic.